The Summer Olympics commence a week tomorrow (Friday, August 8) in Beijing. I don't care. Do you? These games are already a farce. Smog threatens to put a choke hold on the marathon and other outdoorsy sporting conquests. The Chinese authorities are trying to play nice and sweep away under the proverbial carpet various nasties such as dog meat on restaurant menus, clogged highways, and spitting in public -- and the press who have already stationed themselves in the Olympic media centre have already discovered that internet sites have been restricted despite the IOC's statements to the contrary. 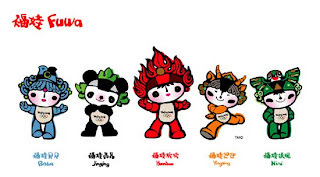 And to top it all off -- check out their Olympic mascots. They're terrible! Did they have to create five in a hopeless attempt to equal one worthy mascot? Just why were the games granted to China with all their human rights offences and the lung-crippling pollution? Despite their questionable ideology, they're an ever-growing power on the world stage and the IOC (never a group to be free of scandal or overly moralistic) wanted a piece of the pie and couldn't help their greedy selves. For shame. Me? I'll be skipping all the festivities and focusing on the EPL which launches a week later. At least I won't have an asthma attack brought on by watching! Amen, LTG! I'm giving you a standing ovation right now. You have succinctly written my exact feelings about the Beijing Olympics. We're not alone, either. Most people I know who normally watch the Olympics couldn't be arsed to muster up a smidgen of fake enthusiasm for these games. It's too bad, really. Personally, I won't wait around for specific events, but if I happen to flip by and see some gymnastics coverage, I'll watch that. Other than that, I'm not too bothered about the other events. Ditto 100%. I'm totally boycotting on human rights violation concerns alone, not to mention environmental issues. Boo on the Committee for even thinking Beijing was a good idea. I like the divers, men with hot bodies in tiny pants, whats not to like? Not that I'll be watching though, may just have to search for pictures.